In the process of taking a drink of water I noticed a sparkle of light that came into my field of vision as I sat at the kitchen table. I froze in mid motion as I lifted up the glass to my lips to take a drink. Reflection and refraction played a major role in the way this image came into existence. Light from a small spot light in the ceiling passing through the water and then through the striations in the bottom of the clear glass projected an image on to the mat table surface. The pattern displayed on the surface varied in form as I slowly changed the angle of the glass in relation to the table. 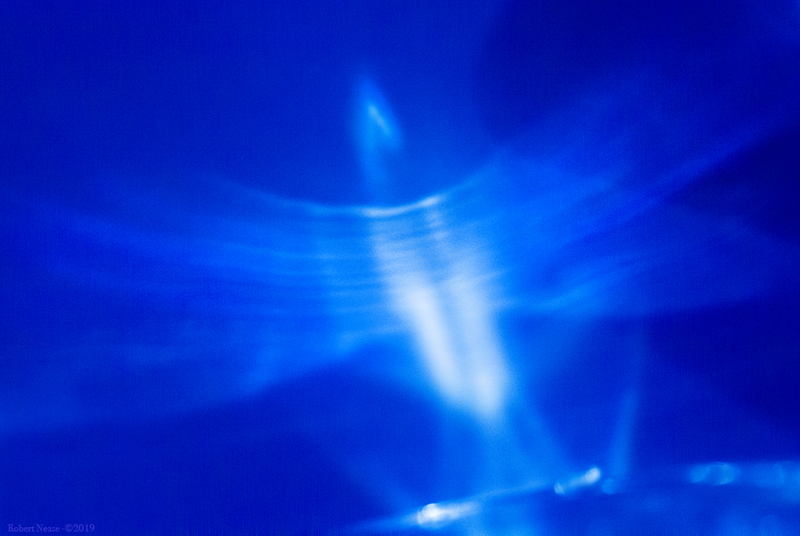 Eagle, spaceship, apparition or angel all appeared with only slight movement of the glass of water. I settled on one illusion that seemed to show up more that the others. Shooting with a macro lens gave me a shallow depth of field that only added to the feel of the abstract visitors. In the end, dialing to the cool side of color finalized the picture and granted me a visual record of the visitor. Apparition? Angel? It’s a toss up. I am leaning towards angel. Enter it in CA. I like it. For me I see a water-propelled rocket I used to play with as a kid, or a wind-up toy that makes a lot of thrashing sounds.